website – Using roofoveryourhead you will create your own individual and unique website for your home. Your website will allow you highlight the general and individual features of your home to literally millions of potential buyers, and produce more targeted campaigns to attract, smaller more focused group. Your website will be accompanied by your own unique and memorable website address or URL , e.g /29 Acacia Road, that will be used on Google, other search engines, social media and on marketing material to direct potential buyers directly to your home’s home page. Running parallel to this will be a more descriptive URL that describes what your are selling, e.g. /three_bedrooms_oxford, which is simple, informative and helps with the all important search engine optimisation. Distribute online, e.g. email to interested parties. Give to potential buyers when they come to view. flyer – hard copy and electronic version – Again this is generated by the info that you add in the Sales Room. The flyer is a snapshot of the property containing the photo of the front aspect of the property, brief details, including price and of course a link to your unique webpage. This is probably best used for advertising; put it up locally where it will get noticed, e.g. notice boards, newsagent’s windows, telegraph poles. Always ask for permission but you will be surprised how helpful people will be when they know that you are doing this for yourself. online marketing – Unlike other ‘independent’ private sale sites, we do not pay well known property portals for the privilege of appearing on their listings, we do not use temporary pay for click promotions to draw clients in then drop them when we have their custom, nor do we have pages with every property permutation known to man. Instead to keep your costs down and focus on your home rather than everyone else’s, we make great efforts to organically register and climb your property through the search rankings. Your personal website will be online immediately and will be reviewed by Google and other such search engines within 24 hours. It is your site, the more you add and update the better ‘- search engine Optimisation is often over complicated, if your home’s website is relevant and thorough it is not only good for the search engines, it’ll be good for your buyers too. A win win. social media – Anyone who has viewed one of the many millions of photos, clips and messages posted online, will be aware of the fantastic marketing reach and power of social media. How many people do you know? How many do they know? And so on. The world is at your fingertips, let it know that your marvellous property is up for grabs. for sale board – Even in these days of multi channel, multi media marketing, the simple board that sits out of the front of the property is a critical sales tool. At a basic level it lets everyone know you are open for business, it also draws attention to your home; not just for your neighbours and friends, who may know of someone that’d be interested but visitors to the area, including people that may be visiting other properties for sale in the locality. advertising – You can advertise in the property section of the local paper. You can get small adverts in local papers for a few pounds. 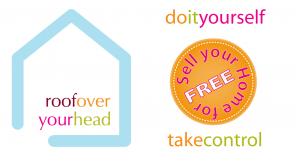 Linking this to your roofoveryourhead website makes a cheap advert very professional and effective. You can obviously make use of further advertising on the Internet, linking to your unique property website. Some websites will do this for a fee, others will list your property for free. word of mouth – While we don’t expect you to become a salesman overnight, you need to appreciate that your potential buyer can be anywhere. Never miss an appropriate opportunity to let someone know that your house is for sale; even if its not for them, they may know someone that it’d be perfect for. Certainly let your friends and family know that you, not an estate agent, are selling your home. You are leading the way so ask them for ideas and assistance. It will all help to get the message out there.